Got home the other day to find one of our greyhounds with a large and nasty cut on her back. Not much blood, but the cut was down to the fascia. They are notorious for having thin skin, but I've searched high and low and can't find any evidence or object that could've done it. They were digging in the garden and uncovered a buried brick with a sharp edge, but no blood or hair on it. It also doesn't really look like a bite from our other greyhound. A few friends have floated the idea that a hawk or eagle or something might've done it. It sounds far fetched, but I'm beginning to wonder if they might be right. All stitched up, but high as a kite and with a little less hair. Nasty. Our cat is in a turf war at the moment, but nothing like that. Ouch. How much did the vet slug you? 42 here, so ours are inside too, with quick stints outside to the clamshell pool to cool off. Got out of it for $450 all up. We don't have pet insurance. Part of me wants to get it, but the deal is generally so bad with only certain things covered or only 80% of fees covered, it's better to just save for a rainy day, as such. Haha, love it! Our other greyhound looks very similar with white feet and tip of tail, and loves toys and roaching. 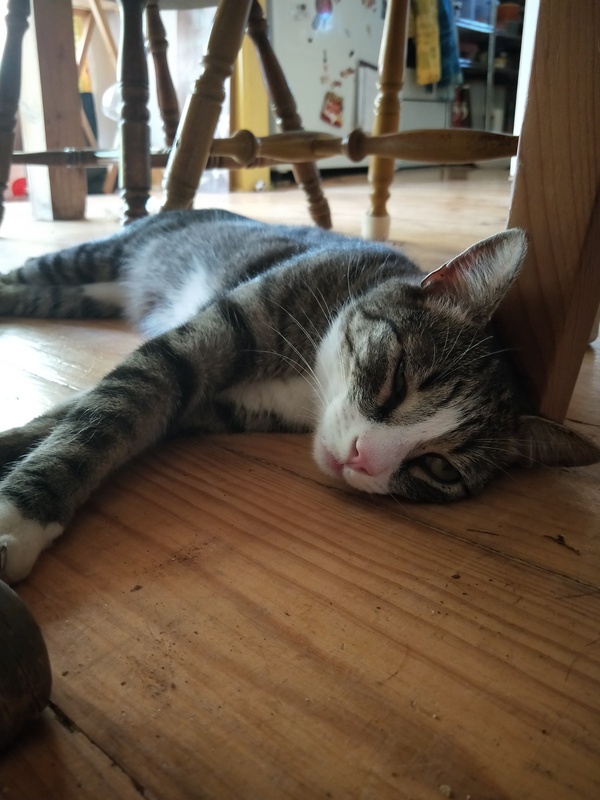 He's flat out on the kitchen floor at the moment, waiting for scraps. Just got my dog out of the Emergency vet after almost a week, blood infection. $10k ish was the final bill so far, still another visit back in two weeks. Rescue Dogs are the best dogs! Good on ya Binner, good to see the poor bloke has a new family to bring joy to. Love Bassett hounds. Just watch out for ticks in the ears. I've heard some horror stories. This striker has to lose some serious weight, he was loved with a lot of food from previous owners I suspect.